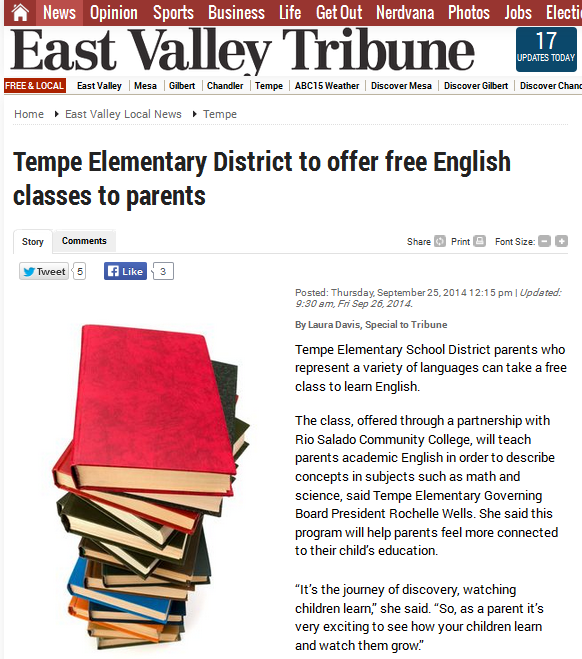 Rio Salado College is working with the Tempe Elementary School District to provide English language classes to parents. This East Valley Tribune story by Laura Davis includes a discussion with Kate Packer, Director of Rio Salado's Adult ACE and College Bridge Pathways Workplace Education program, who talks about how this community service works. Rio Salado offers English Language Acquisition for Adults (ELAA) classes Valley-wide. To learn more, visit: http://www.riosalado.edu/programs/abe/Pages/elaa.aspx.